By now, it’s no secret that the IT Resilience Platform that Zerto has come to be known as offers complete flexibility when it comes to multi-cloud agility. This agility allows businesses to accelerate their digital transformation and truly take advantage of what the public cloud platform offers – ensuring even more freedom to choose your cloud and to be able to replicate workloads to, from, and even between public clouds. As there have been great improvements in Zerto’s any-to-any story, one in particular I’d like to focus on in this article is AWS (Amazon Web Services). Orchestration allowing not only targeting AWS for DR or for workload migration, but now the ability to come back out of AWS to on-premises datacenters, or even the ability to replicate between public cloud providers (AWS, Microsoft Azure, IBM Public Cloud) and Cloud Service Providers (CSPs). Zerto Analytics visibility between all sites, including public cloud, now with network statistics and 30-day history. Now, while these improvements are exciting and offer even more cloud agility to customers, one can’t help but realize that before you can actually start taking advantage of ZVR 6.0 to achieve a hybrid cloud architecture or DR in the cloud (specifically AWS), there are some pre-requisites to complete before doing so. That said, meeting those requirements may not seem as intuitive as you’d hope at first glance. 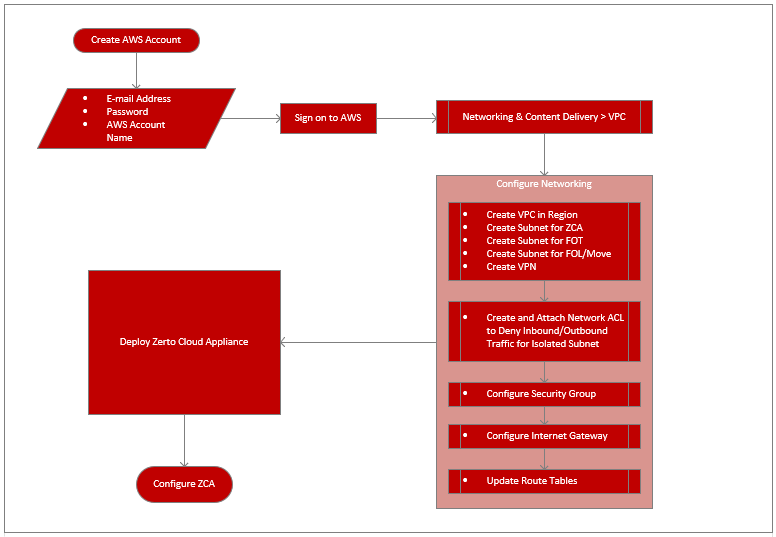 While having a cloud use-case is usually the first step, and is determined by business requirements – the challenge lies within understanding what exactly needs to be configured in AWS for ZVR functionality, and how to accomplish it. If you take a look below, the workflow itself is a multi-step process that may not be very easy to perform, until now. In my usual fashion of wanting to know exactly how things are done and then sharing it with everyone else, I’ve written a how-to document for configuring AWS for Zerto Virtual Replication, which I am happy to say has been turned into an official Zerto whitepaper and is now available for download! As usual, feedback, is welcomed with open arms. If you find this useful, please share and be social!